When talking about the Synthi 100 may happen to make some confusion about what the acronym actually means. Commonly the name Synthi 100 means the modular analog synthesizer made ​​in the early seventies in London; but it is equally true that in reference literature the name Synthi 100 is also used to indicate the complex computer system within which the analog synthesizer was inserted, and that it was an upgrade of it, rather than a new machine. In this article, then I would write about the Synthi 100 as a system rather than as a single synthesizer. The Synthi 100 analog synthesizer – At the end of the sixties, Peter Zinovieff, in collaboration with David Cockerell and Tristram Cary, institutionalized his private studio and founded the Electronic Music Studios, a company specializing in the construction of electronic musical instruments, commonly known with the abbreviation of EMS. The first machine realized was the VCS-3 in 1969, a small portable synthesizer who had highly successful among some bands like Alan Parsons Project, Pink Floyd and Roxy Music. This was the point of reference for the next Synthi 100, a machine more complex, of which the EMS realized about forty specimens since 1974. 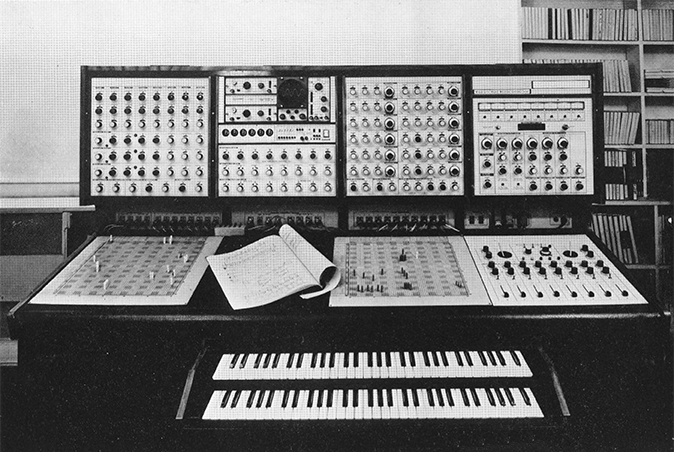 A picture of the Synthi 100 modular analog synthesizer. On front you can see the two keyboards and, at the sides of the book, the two panels to create patches for the modules. One of these, at the time sold for about £ 6,000, was also purchased from the Electronic Music Studio in Cologne around 1974, and Karlheinz Stockhausen used it for the composition of Sirus (1974/75). Detailed picture of the Synthi 100 synthesizer. The dimensions of this machine, as evidenced by the Synthi 100, unlike the VCS-3, was designed for permanent installation in the centers for musical production: about 2 feet wide, 1 deep and over 1 meter and a half tall. Its technical specifications speak of a machine equipped with two keyboards duo phonic, that is able to play two voices simultaneously, for a total of 4. It had an integrated sequencer, and two 60×60 matrices through which to create links between the different modules. These represented a very important feature, as it allowed to make the Synthi 100 a very versatile tool; also the availability of numerous external modules it ensured a continuous expansion of the potential. The EMS Synthi 100 – One of the most important upgrade made ​​to the Synthi 100 synthesizer was to transform it from analog to hybrid system, that consists of an analog part and a digital, according to a scheme very similar to the Groove system developed in the United States by Max Mathews in the late seventy. 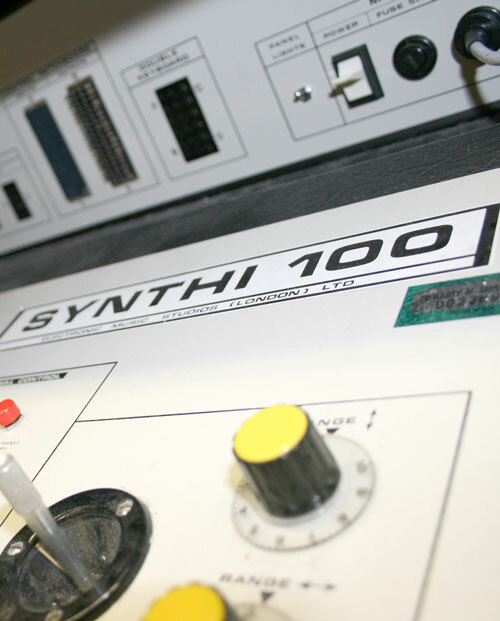 An overall picture of the EMS Synthi 100. On the left, cut, you can see the two teletypes for the management of the PDP-8, contained in the first rack immediately after the second teletype. Reading the EMS presentation brochure, it was with the creation of the new computer system project that became important to begin to distinguish between the Synthi 100 analog synthesizer and the Electronic Music System Synthi 100, abbreviated as EMS Synthi 100. Another picture of the Synthi 100; I think it is not in the same previous studio. The equipment – What were ultimately the constituent parts of the system? The computer part was constituted by two PDP-8 used for the control of the analog synthesizer and for the storage of incoming data from Synthi 100 and from the classical devices with voltage control – oscillators, filters, modulators – which was equipped with the synthesizer. The communication between the two systems was done through a digital interface favored by 4 AD converters, able to transform digital information into electrical voltages, and 64 DA converters with a resolution of 6 bit; only four of these with a resolution of 10-bit for greater definition of control. 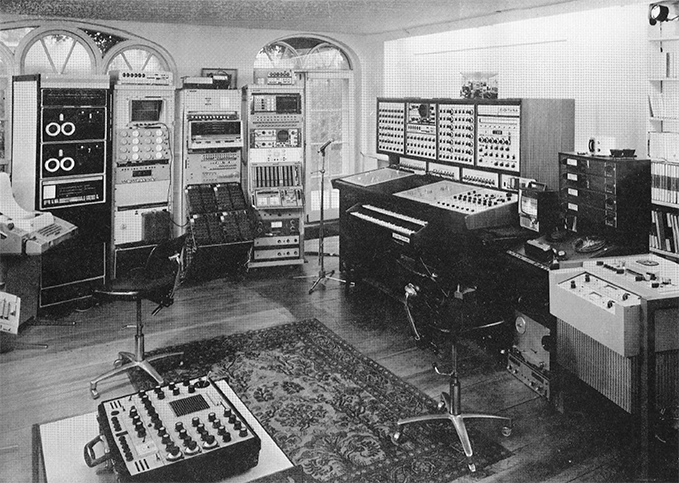 Another picture of the equipment of Electronic Music Studios. The children in the photograph should be the Peter Zinovieff’s sons. The software – It is clear that the hardware portion of the system required a management software that would allow its use. This was designed by Peter Grogono who developed the Musys, the use of which was not strictly necessary for the operation of the system, but certainly recommended to be able to exploit the full potential; Otherwise, the computer could be used as a simple sequencer in order to save all the parts played on synthesizer. In general, every composer was given the opportunity to save on magnetic tape a profile configuration data. Note that the software could also be purchased separately from the rest, probably to integrate with other systems hardware; as it was possible to develop other applications, starting from the purchase of the base system. 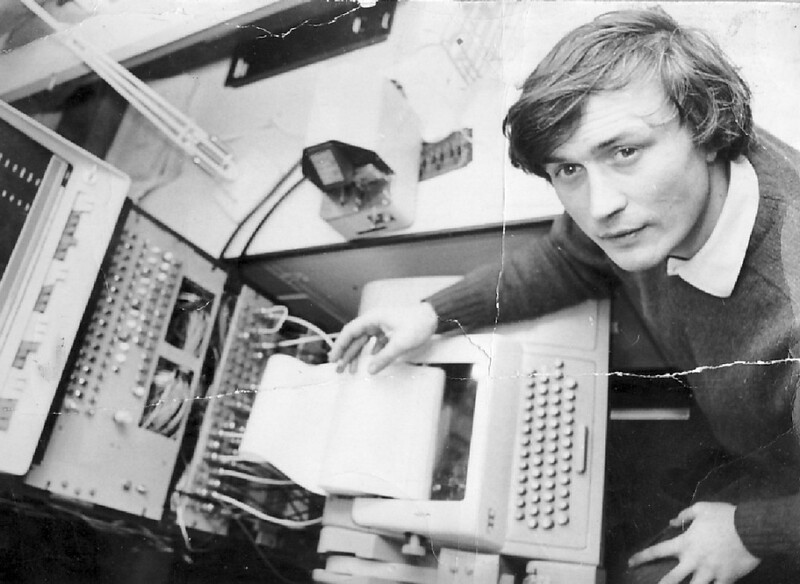 Peter Zinovieff teleprinter of the PDP-8, which is cut on the left side of the image. Via 120years. The Computer Synthi – This complex hybrid system has been used for the composition of numerous works, which I have already listed elsewhere (see item Musys); but here I want to emphasize that the confusion around the Synthi 100 I mentioned at the beginning of this article, is made even more complicated by another fact. Around the second half of the seventies, between 1975 and 1977 to be precise, the EMS decided to build a hybrid system much more compact that would replace the bulky EMS Synthi 100. This had to be called Computer Synthi, equipped with a PDP-8 computer within a structure smaller than its predecessor. In truth, this machine is realized only a few copies considered prototypes, in fact the machine was never marketed. AA. VV. 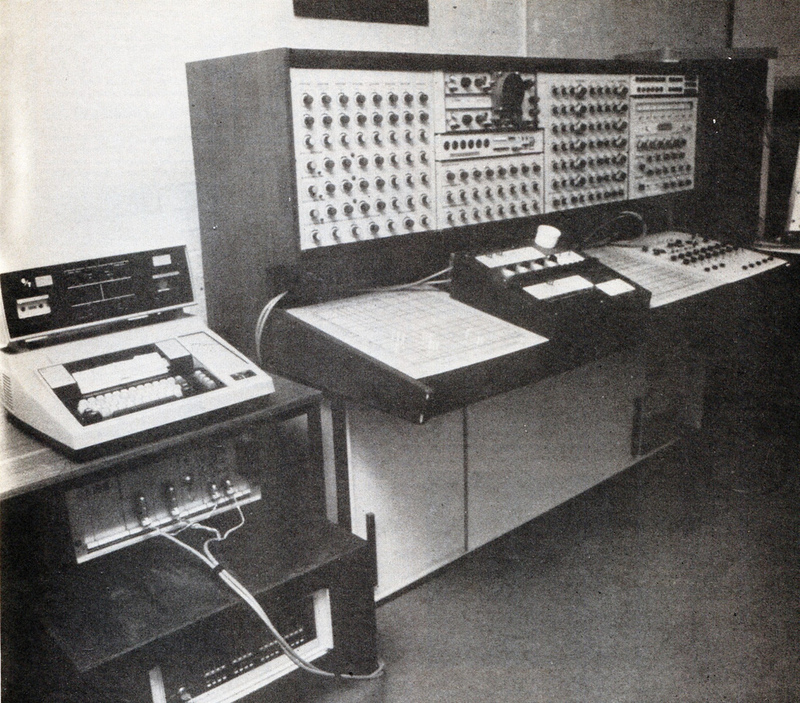 Computerised Electronic Music Systems, Information brochure of the EMS, 1974. AA. VV. Professional Electronic Music System by EMS, Information brochure of the EMS, 1974. Vail, Mark. Vintage Synthesizer, Miller Freeman Books, 2000.